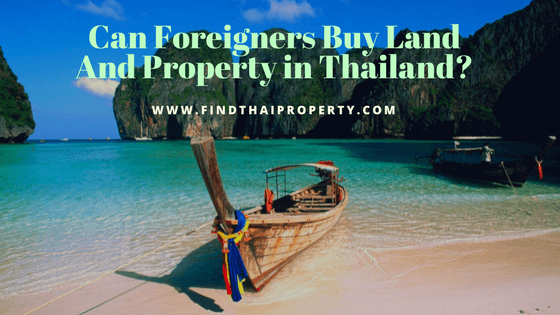 Can Foreigners Buy Land and Property in Thailand? Thailand is a land of opportunity – this country has become an attractive location for foreigners seeking to make a better life for themselves. Furthermore, it is also a superb country for those who wish to experience a quiet and enjoyable retirement in a favourable climate and a country packed full of culture, historic sites and stunning landscapes. In the last 5-10 years, Thailand has experienced a surge of foreign investment and growth of its ever-increasing expat community. Foreigners from neighbouring Asian countries such as Singapore, Hong Kong, Japan and China are attracted by the employment opportunities, cheap property prices and relaxed lifestyle. Additionally, an increasing amount of Europeans are taking the plunge and moving to Thailand to seek adventure and to live in an exotic location. If you wish to purchase a plot of land in Thailand, the process for foreigners is unfortunately convoluted. By law, a foreigner cannot legally own land in Thailand. Despite this fact, there are some methods that are available to comply with the law but they do sacrifice a degree of control and require a lot of trust. A foreigner may own Thai land under the name of a company registered in the country. A Thai national must have a majority stake in the business, however (51% or more) and the land deeds will still be registered under the Thai company, not the foreign individual. If you have invested a minimum of 1 million Baht in Thailand you are entitled to buy 20 Rai of land (Rai is the unit of measurement for land in this country). You can only use this purchased land however for residential purposes only i.e. to build your own home on. This type of transaction must be approved by the Thailand Board of Investment. If you are married to a Thai national you can legally purchase land. The ownership of the land must be registered in the name of your spouse, however. Furthermore, you must sign a declaration stating that the funds used to buy the land belonged to your spouse beforehand. A foreigner can lease land from a Thai owner. For those who wish to build their own property, this is a great option. You can lease land for up to 30 years (a recent increase) and at the end of the term, there is the possibility to renew that lease further but also the risk of non renewal. Before 1997 it was practically impossible for foreigners to purchase and own property in Thailand. The government, however, has changed laws and regulations drastically in the last 20 years. They did so in order to boost foreign investment and entice foreigners to move to Thailand and help improve the country’s economy. Today, a foreigner can legally own property in Thailand in their own name without any restrictions. There are still various regulations and laws surrounding property purchase but the basic law allows a foreigner to own freehold condo property freely. A foreigner can purchase most condos without any restrictions. Although the laws have been relaxed, you should still research taxes, purchasing methods and common Thai practices before you take the lead. As previously mentioned, owning a house fully is prohibited due to the restrictions of land ownership. This change of culture has indeed improved foreign investment and as mentioned in the first few paragraphs, many people from Asia and further afield are moving to Thailand to take advantage of the Land of Smiles. Hopefully, you will have found this article helpful – check out our other guides for more info on how to purchase a property and the best areas in Thailand to consider living.